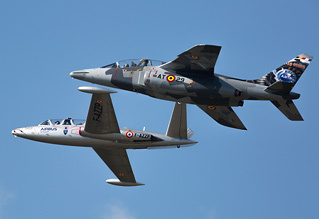 Over the weekend of 12th to 14th September 2014 the celebration of a century of Air Power in Belgium took place at the Belgian Air Force Days which were held at Kleine-Brogel AB. 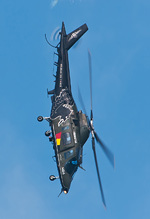 Together with Air 14 in Payerne, "KB" was one of the most highly anticipated airshows of 2014 with its diverse line-up and theme. After the resounding success of Air 14 the previous week, would KB make this two for two and make a fresh change, living up to the anticipation? Andy Evans travelled over to Belgium for the day on Saturday 13th September to find out for UK Airshow Review. Photography by the author and Tim Croton. During the months leading up to the show, excitement grew as new acts were beginning to be announced, both flying and on static. Soon, what looked to be one of the strongest line-ups of any airshow in recent years took shape, backed up by a very reasonable advanced ticket price of just 10 Euros. On the ground this included a Norwegian P-3 Orion and German Typhoons together with a specially painted Belgian F-16AM to replicate the original F-16 prototype colour scheme for the types 40th anniversary. This however paled in comparison to the announced flying display. 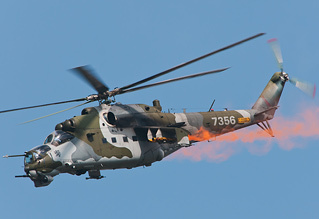 A veritable Eastern European treat was in store with no less than two Mig-29 displays one from Poland and another from Slovakia, joined by a pair of displays from the Czech Republic consisting of their popular Mi-24 Hind solo demonstration and a duo from a pair of Mi-171. Not satisfied with scooping a number of Eastern delights, the flying participation contained a number of the most sought after military displays available including the Italian Typhoon, C-27J, Rafale, Rafale Marine Duo, Team Zeus, Solo Turk and the awesome Ramex Delta. 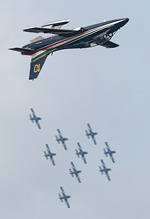 Adding to this strong line-up were a number of international teams including the Red Arrows, Al Fursan, Frecce Tricolori, Swiss PC-7 Team, Royal Jordanian Falcons, Breitling Jet Team and "the locals" the Red Devils. Rounding off the line-up were a number of warbirds and solo aircraft including the Dutch Spitfire and one of Pilatus' PC-21 demonstration aircraft. 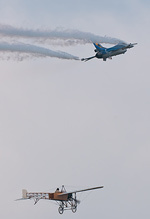 As can be expected from either a major Belgian or Dutch show, the centrepiece of the flying display involved an air power demonstration sequence involving all aspects of the Belgian Air Component including eight F-16AMs, C-130H, A109, Hunter-B UAV and their newly entered into service NH90-TTH. Excitement was further peaked when news broke that also taking part in this year's demonstration would be a NATO E-3A and an Airbus A400M Atlas. The stage was set for what appeared to have the potential to be an epic show. It was therefore disappointing to hear in the days leading up to the show that the Italian Typhoon and C-27J had cancelled and that the Rafale Marine Duo would now only appear on static. However the line-up was strong enough to survive these losses. Arriving at the airfield early on Saturday morning giddy from reading reports from the day before on the UKAR forums the sight that was beheld was not positive, the area was shrouded in low cloud but there was some hope that this would clear by the time the display began at 9am. Allaying concerns from the advertising that the gates would be opened at the same time as the flying display was scheduled to begin, the gates to the airfield opened at 8am however very quickly signs became apparent that there may be some issues with the organisation of the showground. Whilst the gates were opened, the vehicle barriers within for a short time were not opened and, as the few thousand amassed enthusiasts surged forward, a crush point was created as people tried to go around the barrier or crawl under it. Whilst this only happened for a few minutes until the barriers were raised it was still a dangerous situation that could have and should have been avoided. As can be expected the low cloud in the morning meant there were a number of casualties early on in the flying display. Sadly this meant that two of the star acts weren't seen by Saturday only visitors namely Team Zeus and the Slovakian Mig-29. This was obviously disappointing but completely out of the hands of the organisers. A number of acts did however attempt to display during the low cloud and kudos must be given to the Dutch Spitfire and Hunter display pilots. The Spitfire in particular gave a master-class in how to perform a topside on a long display line with multiple passes in extremely challenging conditions. During the low cloud the temperature did not rise and this highlighted another slight issue with the ground organisation of the show, namely the catering. A number of people wanted coffee but for reasons completely unknown to me, the ticket selling booths for the catering stands did not open for business until 10am, a full two hours after the gates opened leading to large initial queues during the central piece of the event. The cold also resulted in a number of people perhaps needing to relieve themselves more often or earlier than planned and this highlighted the third and final poor piece of planning of the showground. There was a charge for the toilets of 1.50 per day which is fine considering the cost of entry to the show however, it is also reasonable to assume a proper "service" to be provided in return for this payment. Yes there were toilets, yes there was loo paper (albeit on racks outside and not in the toilets themselves) and yes there were urinals; the issue here was with hygiene and public health at the show. The only hand washing facilities available were water, there was no sign of soap or hand sanitizer what so ever. Yes this is fine for the seasoned traveller who keeps a bottle in their bag but for families and general public who are there for the day this is a major public health concern. Why? Well you are having people using the loos then handling the food, it doesn't take a genius to realise there is potential for health issues. Something I just cannot see being even allowed at a UK airshow by the authorities whether you pay to use the loo or pay to enter the event or not. The low cloud was still present during the tactical demonstration which resulted in a limited display from the F-16's including no flares being used, there was also disappointing news that the A400M would not be taking part. Making a welcome entrance was the NH90 which was positioned for all to see together with the addition of the Czech Mi-24 to the sequence. That aside the demonstration did seem to be drawn out longer than was necessary with the commentary stating on numerous occasions that the next stage of the sequence would commence in "two minutes" making the action very stop start. Whilst the flying action was impressive the inclusion of the ground combat was less than, this was centred directly in front of the VIP tents and was not visible anywhere else on the very long display line, it did feel like this part of the sequence was not for the public's benefit. Those that have visited an event at KB will know, the majority of the flying static are located along secondary runway/taxiway in front of the display runway. 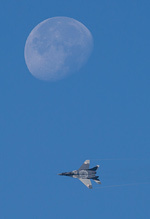 This year's static was very well attended with a number of fast jets from around Europe present. The use of the runway allows for uncluttered background static photos however as has been the criticism of a number of shows this year, how they are grouped together can cause difficulties. In this instance, the specially painted F-16AM was flanked by other aircraft in way that meant the special scheme could not properly be painted, a real shame. It again seemed that this portion of the static was set up for the benefit of the VIP's and not the paying public. Thankfully, following the completion of the air power sequence the low cloud lifted, the sun came out and the temperature rapidly increased. Very quickly the flying display got back on schedule and the flares started to fly. As can be expected with such a high quality line-up the competition for star of the show was intense but this eventually came down to three acts. 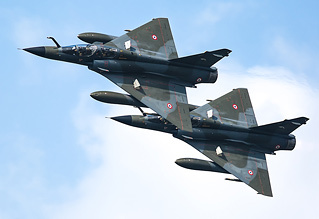 Showing why they are considered the best fast jet duo in Europe right now, the Mirage 2000N's of Ramex Delta stole the show with their demonstration of sheer power and agility. It is safe to say whichever show in the UK manages to secure the debut of this act in the next few years will very quickly put itself in the front running for the award of best show of that year. Hot on its heals was the Rafale C solo display who continued their reputation of being the best solo fast jet display in Europe right now, a superb display of power and agility unmatched anywhere else. 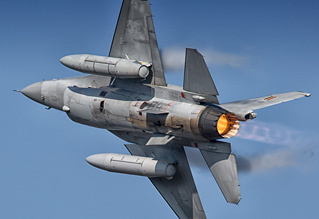 Finally, it would have been a crying shame if some of the Eastern heavy metal didn't feature in the top three; it is therefore fitting that the Polish Mig-29 display took this slot. Not seen for a number of years, the Polish display even included a tail slide which made the display unique, there is nothing like a Fulcrum or Flanker trying to show exactly what it can do in the right hands. It has to be said however, the flying display lacked a natural flow and was very disjointed with very large gaps between some acts which meant many lost interest quickly. So what conclusions can be drawn from this show? Well this show was supposed to be a celebration of a century of Belgian Air Power, it really didn't seem that this was really the case, apart from an attempt to perform an F-16/Bleriot flypast which was ambitious to say the least there was no other attempt at showing the history of Belgian Air Power. This show had the potential to be a real winner and I was ready to sing its praises after months of build up and excitement. However, I came away from this event feeling completely indifferent. Yes the line-up was excellent despite the weather and cancellations but the organisation should have been better especially on the ground and the flying display should have been more fluid. It was also unfortunate that the main celebration theme wasn't exploited more. If Payerne was an example of how to publicise and celebrate a major anniversary at an airshow correctly, Kleine-Brogel could in some aspects be shown as an example of how not to do it. This show wasn't a bad show by any measure however it was far from being an epic show either, I would end by calling KB an OK airshow. It is perhaps fair to say that those who attended all three days including the Friday spotters day more than likely came away with a better view but as a single day visitor I must review the event as I saw it.